I had in my electronic “junk pile” an old Hitachi SR-5150 stereo receiver that a neighbour had discarded in the fertile back lanes of Vancouver, BC. 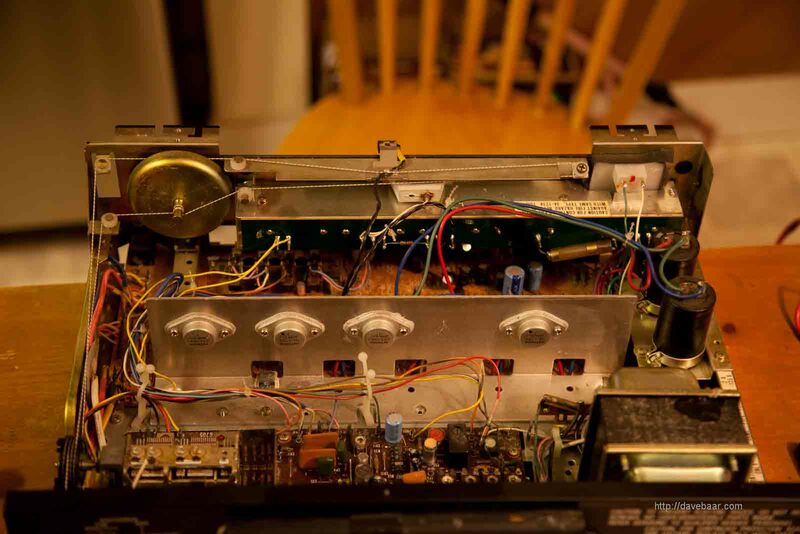 The SR-5150 is roughly early 1970′s vintage; it is all solid state and has all discrete transistors (the power transistors are even Hitachi’s own), and an analog FM tuner driven mechanically with pulleys and a flywheel. Nothing high end, maybe 20-30W per channel judging from the power supply. The receiver was dead to the world; it would not show any signs of life when turned on. I was motivated to fix the thing because I was looking for a decent amp to use as part of a new sound system centred on a home computer. Usual disclaimer: I take no responsibility for injury or loss that may result from following any of the guidance in this post. Due to the high voltages that can be present in electronic repair, there is risk of fire, explosion, injury and even death. Be careful, and when possible, unplug the device you are working on from source power! After removing the top cover, I did some careful voltage checks and found that the 120VAC supply was not even present past the main power input terminals inside. Fuses were all OK. Immediately suspect then were the power switch and associated wiring. Due to the construction of the unit, with the thread loop for the tuning mechanics strung through pulleys above the power switch, I had some disassembly to do to get at the power switch. Note the picture, in case you find yourself having to repair a similar unit. The disassembly has to be done carefully, since it can be a challenge to re-thread the tuner thread if it gets displaced. 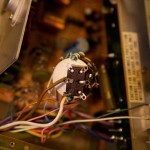 There were also a pair of big electrolytic capacitors for the power supply mounted on a small frame above the switch; that frame needed to be removed for switch access. After gaining access to the power switch, I found that it is a DPDT ganged switch that has the On-Off switch stacked concentrically behind A and B speaker pair switches. Only one side of the DPDT switch is actually used. On inspection, as you can see in the picture, one of the switch terminals was heavily oxidized, and presented an open circuit regardless of switch position. Rather than even bother fixing that part of the switch, I cut off the supply wires, which were in good shape a few mm back from the switch, and soldered them instead to the other, unused side of the DPDT switch, which was in good condition, having never been used. 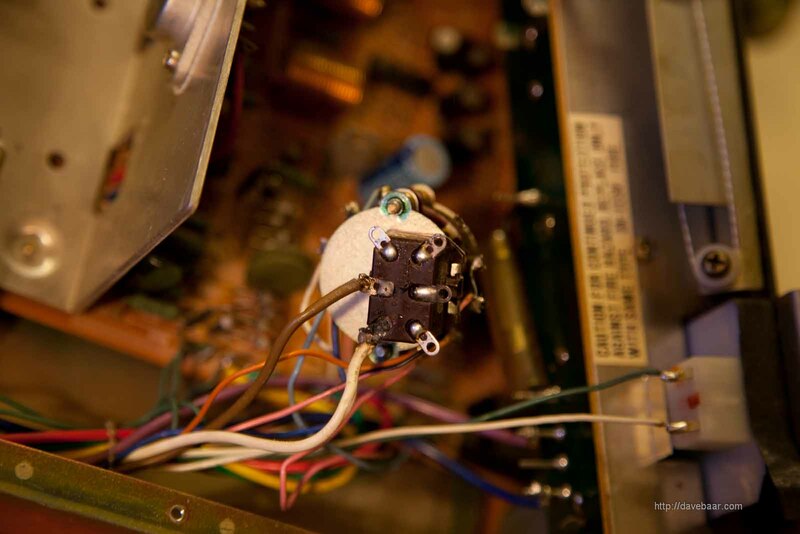 On turning the receiver on, power was present, and subsequent testing showed it to be in fine working condition. Two solder joints for this repair, and no parts needed. It was that easy. I also replaced one dead bulb for the tuner display while I had the case open just because I wanted an indication when the device is on; I’m not really utilizing the tuner. amazing we ned to chat…. skylight landed on it during a rainstorm. money at it if there’s no chance of fixing it. Nora, where are you located? If you can get the receiver to me in Vancouver BC, I’ll happily take a look at it. Water damage can often be catastrophic to electronics since the water will absorb salts and other chemicals inside, and short things out, cause corrosion, and other problems, but if where the water got to was very localized inside, you might be lucky and it might be an easy fix.